What a great weekend in Winchester, TN. When we decided to head to Winchester vs. the Auburn Contest, we were really wanting to redeem ourselves after the showing we had there in 2009. Little did we know how that was going to turn out. Kevin arrived Thursday evening and got set up. 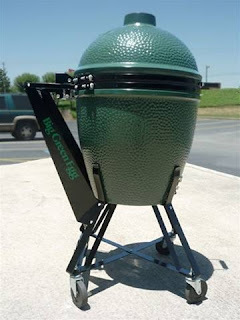 It was much easier to do by himself thanks to the new Big Green Egg Nest Handler's we installed on the XL EGGs. That coupled with the new wider base nest and the All Terrain Nest (Not an Official BGE product unfortunately) made unloading a breeze! After getting set up, Bobby and Charlie of Team Bobby-Q arrived and we headed to the best Mexican Restaurant in Winchester....Camino Real for some good eating. Friday, Tammy arrived after staying home to work on a paper for School and brought Sydney the Schnauzer along with her. We quickly began our prep. Being our first contest of the year and changing up some recipes we were sure to take our time with this one. The weather was Absolutely beautiful the entire weekend which made for some great lounging times as well. After finishing our meat prep, Tammy, Bobby, Charlie and I headed back for more Mexican...I said it was good didn't I? Saturday came along and we hit our groove. We were pleased with our new chicken recipe and how it turned out, Ribs were tasty and Pork looked good. Brisket was amazingly tender but we washed off our rub. Awards came and we took our seats. First call, 5th in Chicken...only our 2nd in the last 2 years...then a 3rd in Ribs....1st call in that category in 2 years, then a 1st in Pork...and later to find out a 15th in Brisket. Ron Harwell was running through the top 10 and got to Reserve....The Long Dawgs....then we heard And Grand Champion...The EGGseQuetive Council....we were so excited even Sydney started barking.